For kids, right? I mean really, when’s the last time you had one? If your answer is anything longer than a year ago, then you’re missing out. Sure, most ‘pops are lame, but there’s a bunch of really good ones out there. What’s more satisfying than sucking on something that tastes good? Exactly. Oral fixation. Not a myth. Look at the actual pop. See those little flecks inside of it? Orange zest. The deal with Das Foods’ lollipops is that they’re all natural, a big trend in the candy world. It also happens to be a trend I really like, for many reasons. First, the obvious, natural means less chemicals means less pummeling from Mrs. Jonny Guru. She’s not such a big fan of anything artificial, proven by the fact that she….strongly encouraged me to quite diet sodas a few months ago after complaining about my habit for years. Now I drink bubbly water “with a splash of juice”. And honestly, I like it. I feel better. But she knows better than to EVER comment about my candy habit. That’s why I love her! But back to these pops-I dig the fact that they’re natural cause it means a lot of good things can happen and a lot of bad chemical things don’t have to happen. Much more than that though, I like the natural candy movement cause the candies definitely taste better when they’re made with the real deal OG ingredients. The orange really harkens an orange, down to the annoying spray of zest in your eye as you peel it. It’s all about replicating real fruit flavor, something that’s not easy to do. 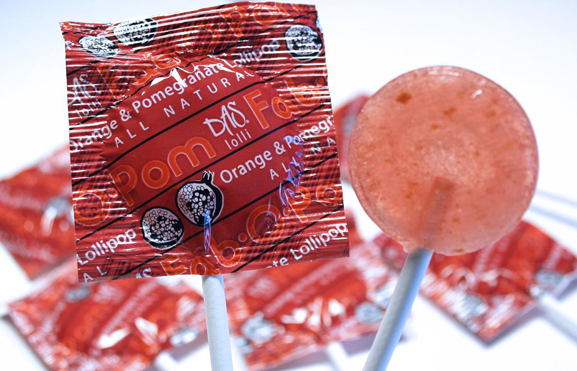 The Fab-O-Pom pop appears at first lick to be a standard, orange-y, slightly pomegranate-y taste. But when you really start digging in, you get immersed with the real richness of these two fruits. The zest sticks out from the pop like sugar crystals, making an awesome contrast of consistency. Once I got started sucking on this bad boy, I couldn’t stop. Honestly, it’s one of the best tasting lollipops I’ve ever had. I haven’t had the luck of finding these in retail stores yet, so if the kind folks at Das Food want to send me a gross of these Fab-O-Pom pops, I’ll gladly be waiting by the mailbox! However, even if they don’t, I’ll still look for these and be buying them when I can. Seriously legitimate flavor going on here. Also, they’re small-only 30 calories, so you really don’t need to be concerned with your backfat growing after eating a small handful of these playas. We’ll be reviewing at least a few of the others as I know the world is eagerly waiting to learn more about the bacon licker. But for now, understand this: Fab-O-Pom pops are good for adults & kids alike, as they’re small and natural and hella good. Well done. Would I Buy Them Again? : Absolutely, if I could find them! What in god’s name does that first comment mean? Just found this place. They have the Pure Fun Organic Candy Fruit Pinwheels for just 99 cents!!! I don’t know what the limit is but I just ordered a case of 6. Nice post because you express your opinion accordingly and we understand your side.We must respect our personal choice because we are the one whose responsible for our action. Sweet Hampers, that’s the best comment I’ve ever read. Not sure if you’re being serious or ridiculous, but either way we dig it.